The University of Florida College of Pharmacy presented 277 first-year Pharm.D. students with their white coats on April 13 in Gainesville. During the White Coat Ceremony, Dean and Distinguished Professor Julie Johnson, Pharm.D., and college leaders commended the students for their achievement thus far, while entrusting them with a greater commitment as they pursue their pharmacy degree. “The white coat is symbolic of the highest ideals of the practice of pharmacy, and it is worn with pride as Pharm.D. students progress through the curriculum,” Johnson said. The ceremony is a time-honored college tradition that recognizes students’ progression through their first year of the rigorous academic and professional pharmacy program. UF was among the first pharmacy colleges in the nation to hold such a ceremony nearly 20 years ago. During his 40 years as a pharmacist, Armistead has learned the importance of making complex topics appear simple and general topics, specific for patients. Armistead concluded his remarks by reminding students that their learning does not end with the Pharm.D. curriculum. He encouraged them to develop a continuous professional development plan because drug therapy continually advances. 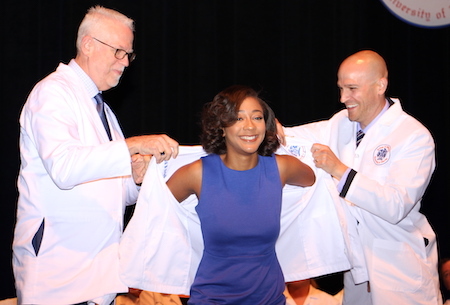 Clinical Associate Professor Sven Normann,’81, Pharm.D., pictured left, and Anthony Allegretta, Pharm.D., ’06, from WellCare, present a white coat to first-year student Tychell Branchcomb. Following Guerci’s remarks, students from UF’s three pharmacy campuses in Gainesville, Jacksonville and Orlando received their white coats. A faculty member, or donor who helped fund the purchase, coated each student. After the coating, the students collectively recited the class creed that demonstrated their commitment to serving patients and loyalty to the profession. WellCare served as the corporate sponsor for the 2019 White Coat Ceremony.